The deadline for RIS News' StartUp Competition is quickly approaching! Submissions must be in by Friday, May 19th. RIS will host the live competition for technology startups at its Retail Executive Summit (RES) in Scottsdale, AZ, and the winner will receive a check for $2,500 and coverage in RIS throughout the year. The startup competition will be judged by a panel of retail experts consisting of a retail CEO, a Wall Street analyst and a venture capitalist. The competition will take place at RES, June 14-16 at the Scottsdale Four Seasons Resort in front of more than 150 senior-level retail industry executives. RES, now in its 16th year, is the original high-level retail conference connecting retail executives with sophisticated strategies and cutting-edge technology. This intimate forum offers executives forward-looking vision, practical learning, peer-to-peer exchange, and dialog through highly interactive sessions and networking opportunities. Three retail technology startups selected as finalists for the competition will make 10-minute pitches before the panel of experts in front of the live audience, who will also vote using digital polling technology. Each candidate will make their case as the best solution to push retail into its next phase of evolution. Candidates will be evaluated based on how significantly their solution can improve a retailer’s business or radically alter the industry. Roddy Lindsay, CEO, Hustle. Hustle’s easy-to-use mobile app, allows associates to send 16 personal text messages in the time it would take to make one call. Coy Pittman, founder, president, and CEO, Disco Melee. Disco Melee is a next-gen social network/platform for video game players and enthusiasts. Einar Rosenberg, chief innovation officer, Creating Revolutions. Creating Revolutions is a mobile communication platform. Disco Melee was crowded the winner. "I was honored to be selected to showcase my company," said CEO Pittman. "I was especially excited that RIS is so forward thinking as to realize the potential verticals associated with E-Sports in terms of retail. In chatting with a few notable retailer representatives after the competition, it was refreshing how quickly they understood the need for their brands/products in this space." Startups for the competition are defined as being in the retail technology business less than three years, a stand-alone company, revenue less than $5 million per year, fewer than 50 employees, and having secured no more than two rounds of funding of less than $10 million. 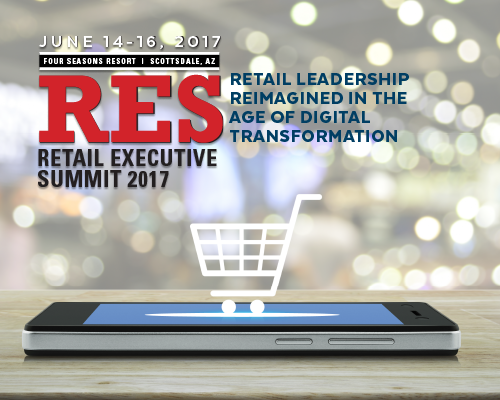 Visit the RES website at https://events.ensembleiq.com/2017-retail-executive-summit to find out more about the sessions and how retailers can make invaluable connections and learn actionable strategies to grow their businesses for continued success.